2019: The Year for Your Practice to Be Faster, Higher & Stronger! 2019 is an odd-numbered year, which among other things means that there are no Olympics. So you’re on your own to reach Olympic ideals this year. How? Here are a couple of examples: You can get your patients out faster than ever with an efficient scheduling system, you can build a stronger team and improve the patient experience, and you can have higher production than last year by adding services and focusing on the fundamentals. Let’s stick with the Olympics analogy: no runner wins if he starts slow out of the blocks. January is the month to make that happen. 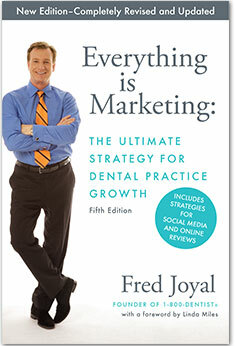 One thing we learned early at 1-800-DENTIST is the first quarter of the year surge time in dentistry. Our phones ring like crazy. People’s dental coverage renews, they decide to take care of their bodies in a general way, and dentistry gets included in that, and people start doing all the things they put off. Which means you have to seize the days–all 31 of them–to make this year the highest production you’ve ever done. And isn’t that what you’re going for? What that also means is focusing on the fundamentals. You know, all those things that we could be doing and should be doing to run a tight ship but somehow by December half of them slipped by the wayside in all the merriment. Plus you may want to do some things differently. Maybe what you were doing in the past isn’t working so well anymore. If so, don’t be surprised. That’s true of most businesses today. So what I’ve done is put together a webinar combining some powerful fundamentals with some innovative approaches so that you can have your most satisfying, most productive year ever. You up for that? It’s called “Fred’s Top Ten Tips for a More Profitable 2019.” Nothing confusing about that. I”m doing it on January 18th at 11 am PT/2 pm ET. It’s free, and at the end I’m going to take questions for as long as you have them, and you’re going to take off like a rocket this year. So yes, I’m pitching a webinar in my blog, because I want you to take time and listen for an hour, and come away with a definitive strategy, a short list of what you’re going to do to transform your practice, to get back to basics if necessary, and to serve more patients than ever. And don’t get all frustrated if you can’t log in at that time. Register anyway, and I’ll send you a link so you can watch the webinar later. But you better watch the whole thing if I do that!! Promise? Okay. Join me Friday January 18th, and let’s make this a super productive year! Have We Lost Our Ability to Savor? As we roll deeper into the 21st century and face the beginning of yet another new year, I wonder sometimes what this rampant ADD we all seem to be fully engaged in will add up to in terms of life satisfaction. We seem to relentlessly pursue endeavors in anticipation of the next endeavor, or the one after that, instead of enjoying the one we’re doing, or we doing things that are enjoyable three at a time, instead of letting ourselves relax and just participate in a moment without multiple distractions. This behavior is not new. It all started back when I was young, with TV dinners. Suddenly you couldn’t just sit and eat a meal. You had to be watching a show at the same time. So don’t blame the cell phone. It happened way before that. But now, if you try to have dinner with your family without anyone checking Snapchat or Twitch forty times during the meal, then the irritation/anxiety/bad attitude index goes through the roof. And if I see one more dad sitting looking at his cell phone while his son or daughter sits next to them playing by themselves, I’m going to scream. “This kid will be in college before you know it,” I want to shout. Never mind that, in fact. Within three years the kid will have his own smart phone and you will cease to exist. And I’m not saying all this technology is bad. I love it. It’s made it possible for me to be in contact with people I love much more easily, and answer any question without having to use my memory, and be reminded of the thousand things I’ve scheduled in my life. But texts interrupt us, notifications distract us, email inundates us, and the idea of watching a TV show while playing a game on your iPad and checking Facebook every ten minutes seems as antiquated as riding a horse to work. And let’s also dispel the myth of multi-tasking. It’s been absolutely demonstrated with brainwave studies that we are simply switching back and forth between the tasks, not multi-tasking. Which means we are losing our ability to focus for more than a few seconds. In a single generation we’ve gone from reading War and Peace to not being able to finish reading a Tweet because it takes too long. And I’m just as bad. I drive in a hurry even when I’m not going anywhere. I panic if halfway through my workout the podcast seems to be a load of nonsense. I look at my Apple Watch the second it buzzes with a message. (Although half the time it’s just telling me to stand up.) Is all this bringing me joy? Honestly, no. So where am I going with this rant? I have no hope or even intention of rolling back the atomic clock on technology. What I am suggesting is that we re-learn how to savor. This mad pursuit of multiple activities has suppressed our ability to savor what can be delicious single moments in life. When I was in college we all used to sit and listen to an entire album (that’s a vinyl LP, for you young ‘uns) and then have to flip it over to hear the other side. And that was all we did. And those songs still play in my head now. It was wonderful. We skied without listening to headphones, and we read books from cover to cover, sometimes in one sitting. We sat and had a few drinks without six televisions in our eyeline. We played Trivial Pursuit and actually had to use our brains instead of our phones. So all I’m suggesting is that for 2019, maybe take some part of your day and just do one single thing sometime during the course of your day, and savor it. Sit and just drink your half-caff almond latte. Enjoy it, the flavor, the warmth. Without checking your email. Listen to an entire song, maybe even an entire album, without doing anything else. Chat with a dear friend, phones on silent, tucked away. Take a walk without listening to a playlist or a podcast. Just enjoy the air, the sky and nature, or the bustling world around you. Cook a meal from scratch together, and eat it, enjoying every bite, devoid of electronic distraction. Or just take fifteen seconds and look up at the clouds. Or the stars. Or down at a flower. Or watch your kids play. Just a little bit, for a few moments in the day. And maybe we’ll discover that happiness isn’t so hard to find after all. There is a LOT in the news about Facebook this year, and none of it is particularly good. First, they let us know that if we wanted even our own followers to see our postings, then we were going to have to pay. Then Cambridge Analytica comes along and lets us know that they can easily influence elections using our Facebook data. And that our data is out there a million times over. People have a social media addiction. They need that dopamine hit all through the day. The average person spends 50 minutes a day on Facebook. So if they stop using it, are they going to start reading newspapers? Or worse, talking to people at the dinner table? Or maybe they’ll switch over to Instagram. Well, Facebook owns Instagram. And Whats App, too. And Snapchat is losing people much faster than Facebook, and Twitter still can’t find its purpose, except as a national broadcast system for our current president. LinkedIn? Great if you’re looking for a business connection. Pinterest? Not for the dental industry. The reality is this: most of what’s going on with Facebook has nothing to do with small businesses. The fact that they are curtailing their merging of outside data sources with their own data doesn’t matter except to large businesses, who spend hundreds of thousands targeting ads to people, and of course to political campaigns. For the rest of us, it’s a slightly different version of business as usual. People will still use Facebook to connect with their friends, to get the news and to get spending ideas. Ads will still work. Pages will still use it to learn what it’s like to be a patient in your practice. Granted, Facebook shows a lot fewer people your posts than ever before. We have to adapt to this by making sure our content is interesting, and incorporating things like auto-responses through Messenger whenever anyone comments or likes a post. And we’ll have to pay to boost posts. But the audience is still there. The fact is, 20% of the world’s advertising dollars are spent on Facebook. They’re not going anywhere. They need to make some major course corrections in terms of privacy of data and a few other things. But they are already moving in that direction. And they will be forced to by the government if they don’t. Stay the course. Post interesting videos and photos and contests and events, as well as patient testimonial videos and recommendations and reviews. Boost popular posts. Test some advertising for implants, or aligners, or implants. All the stuff I’ve been recommending for years. It will still work. You might just have to buy some more eyeballs, but hey, it’s been a free ride for a long time.